Singer/songwriter with band and influences spanning acoustic, rock, folk, country and pop. 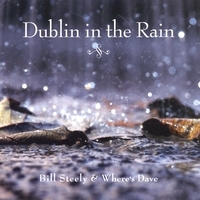 Well it's been a year since the first CD, Where's Dave, came out, and we are very happy to release the new disc, Dublin in the Rain. Thanks to everyone who came to our shows and listened to the music. We had a lot of fun making the new CD at ACME Studio in Mamaroneck, with an all-star cast of musicians, engineers and producers. Dublin in the Rain is the title track; it's a song I started writing while on a business trip last October, jet lagged, walking through the cobblestone Streets of Temple Bar, and missing home. I think the CD rocks, and am very happy with the way it turned out. I hope you'll agree. In addition to the ferocious band, Where's Dave (Gerry Herman, Bruce Rose, Steve Lueker, Elizabeth Bruce and Johnny Leone), we were joined on this record by Robin Gager, who plays a seriously fierce violin. Also playing again on this project is Mark Terrence, featured on guitar and mandolin on several songs. Mark played on the first Where's Dave record also. Another special treat this time around is the inclusion of some vocal arrangements by the talented Greg Trooper. Greg is a great guy, as well as a great songwriter (www.gregtrooper.com). If you want to get on the mailing list for Bill Steely & Where's Dave, or want booking information, you can send an email through the website, www.billsteely.com.